Welcome to our website about ecological agriculture and alternative food networks in China. We are a research team from the Department of Geography and Environmental Management at the University of Waterloo in Canada. There are six people who are working or have worked in this team: the team leader Dr. Steffanie Scott, and Dr. Aijuan Chen, Dr. Zhenzhong Si, Dr. Theresa Schumilas, PhD candidate Danshu Qi and Ning Dai. Here you can find the most recent updates about the greening of China's food system including the development of ecological farms, the emergence of ecological farmers' markets, community supported agriculture (CSA) farms and buying clubs and many other initiatives addressing the growing food security and food safety concerns of Chinese citizens. Please watch our Youtube video here for an overview of China's changing food system. 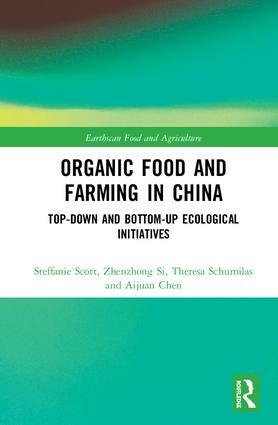 Our new book "Organic Food and Farming in China: Top-down and Bottom-up Ecological Initiatives" is published! You can now purchase a copy here (20% Discount Available - enter the code FLR40 at checkout). This book shows how a set of social, economic, cultural, and environmental conditions have converged to shape the development of a "formal" organic sector, created by "top-down" state-developed standards and regulations, and an "informal" organic sector, created by ‘bottom-up’ grassroots struggles for safe, healthy, and sustainable food. This is generating a new civil movement focused on ecological agriculture and quality food. The authors contrast organic movements and markets in industrialized countries with the Chinese context, with its unique version of "capitalism with social characteristics," collective farmland ownership, and predominance of smallholder agriculture and emerging diverse marketing channels. China’s experience also reflects a commitment to domestic food security, evolving food safety legislation, and a civil society with limited autonomy from a semi-authoritarian state that keeps shifting the terrain of what is permitted. The book will be of great interest to advanced students and researchers of agricultural and food systems and policy, as well as rural sociology and Chinese studies. We are currently facilitating a LinkedIn Group called China’s Changing Food System. This group aims to open a space for people interested in social, economic, political, and ecological dimensions of transformations in China’s food system. It is a space for learning, exchange, debate, and networking. We welcome people with diverse backgrounds to participate in the discussion. We welcome your feedback. If you have questions or comments, please contact us at sdscott@uwaterloo.ca. We have recently published a new book: Organic Food and Farming in China. Use FLR40 promo code to receive a 20% discount.